The 2018 Ultimate Homemaking Bundle Has Arrived (and it ROCKS)! You are here: Home / Organize / Organizing Products & Tools / THE 2018 ULTIMATE HOMEMAKING BUNDLE HAS ARRIVED! THE 2018 ULTIMATE HOMEMAKING BUNDLE HAS ARRIVED! The 2018 Ultimate Homemaking Bundle sale has ended. The good news is that the Ultimate Bundles Group continues to offer different bundles throughout the year (and occasional flash sales on previously offered bundles). If you don’t want to miss out on future bundles, click here to join my newsletter list, and I’ll make sure you’re the first to hear when future bundle sales go live! It’s the most wonderful time of the year! Christmas? Nope. Back-to-school week? Nah. We’ve got a few more months until that celebration. I’m talking about the arrival of this year’s Ultimate Homemaking Bundle! What? You’ve never heard of the Ultimate Homemaking Bundle? I can’t wait to tell you all about it! 2018 ULTIMATE HOMEMAKING BUNDLE: WHAT’S ALL THE HYPE ABOUT? We all know that homemaking and motherhood can be overwhelming. What if you could have access to a comprehensive “tool kit” of amazing, high-quality resources to take some of the stress, overwhelm and difficulty out of homemaking and motherhood? Once you purchase the Homemaking Bundle, you’ll have a full year to download the eBooks and printables and complete the online eCourses. Everything you download becomes part of your permanent library, so you can go back and refer to these resources whenever you need them. 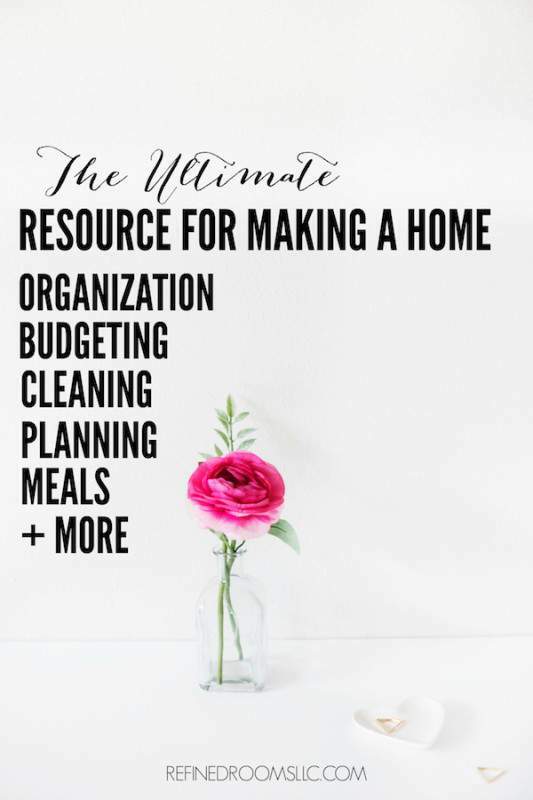 WHAT RESOURCES ARE INCLUDED IN THE 2018 ULTIMATE HOMEMAKING BUNDLE? The first category I always explore when I purchase my Homemaking Bundle each year is Home Management. I’m blown away at the collection of organizing, simplifying, and planning products we have access to in this year’s bundle. The resources in this category will help you to declutter your entire home, tackle your cleaning routines like a boss, and set up chore systems for the kids. In fact, there are two ecourses devoted entirely to teaching you the process of decluttering. I was super excited to see that several home decorating resources are included in this year’s Ultimate Homemaking Bundle. My friend Jenna of the DIY/home decor blog Wife In Progress offers up her new decorating ebook, Home In Progress: The Ultimate Home Decorator’s Guide as part of this year’s Homemaking Bundle! Another fun resource is the collection of printable wall art (courtesy of The Dating Divas) that will help you spiff up any room in your home, even if you’re on a seriously tight budget. Having the opportunity to working from home is truly a blessing. BUT…it comes with it’s own set of challenges. That’s why this category of the Homemaking Bundle is becoming one of the most popular group of resources each year. As a work-at-home Mom, I always make a beeline to this category to check out the current year’s offerings. Of course, I’m excited to dig into the blogging-related resources to up my blogging game. If you don’t work from home but you’re intrigued by the idea, this year’s Homemaking Bundle provides several resources to help you explore various work-at-home opportunities. Oh and don’t forget to download the gorgeous printable pantry labels (especially if you loved the look of my pantry makeover!). Collectively, the library of recipe books included in this year’s Homemaking Bundle puts 441 new recipes at your fingertips. Combined with the plethora of meal planning resources in this collection, you can easily put a delicious and nutritious dinner on the table every night without the 4 p.m. pandemonium that typically takes place in the kitchen. I’m currently working my way through the 90-Day Budget Book Camp Workbook, which I was eager to dig into because Rosemarie Groner (The Busy Budgeter) rocks! I love that this year’s Bundle not only cultivates our creativity, but also helps us to achieve our fitness goals. It even helps us to become the fashionista we aspire to! These days, I often find myself struggling to put together an outfit that I feel confident wearing. So I’ve earmarked the Full Year Wardrobe Plan, Outfit Mastery course, and the Big Book of Outfit Formulas as front-burner resources to check out. This year’s bundle emphasizes the importance of intentional living and tackling our days with a purpose. To that end, it includes some awesome resources for goal-setting, planning, and simplifying. Planner Girls — this is YOUR category! Some of my favorite bloggers have resources in the Intentional Living category, including Abby Lawson of Just a Girl and Her Blog (the Simplify printable collection), and Tsh Oxenreider (her ecourse, The Essentials: 7 Projects to Sane-ify Your Life is life-changing). Being a mom is H A R D. None of us should have to go it alone. With this set of encouraging and inspirational resources, we don’t have to. Yey! Not only is motherhood is hard — so is marriage! If you’re looking for some ideas and concrete actions you can take to nurture your marriage, you’ll get that via the Bundle as well. Hmmm….I could definitely use some date night ideas. This bundle is available for just 2 days. That’s why the Ultimate Bundles team can offer so much, because they only have permission to sell it for such a short period of time. The total value of the 2018 Ultimate Homemaking Bundle is $3,687+ (plus $181 in bonuses), but you get it for just $29.97. That’s 98% off what it would cost to buy all of the items separately. 98% off? Yes please! If you think getting this library of homemaking resources for less than $30 sounds like a steal, then make sure to grab yours before this deal ends! Need more information? Click here to see a the complete list of products, browse through Frequently Asked Questions, and learn about the 30-Day 100% satisfaction guarantee. Don’t forget that the 2018 Ultimate Homemaking Bundle is only available until from 12:00 a.m. Monday November 5th through 11:59 p.m. EST on Tuesday, November 6th. Which resource will YOU dig into first? Be the first to know when future Ultimate Bundles go live! Give me a heads up please!